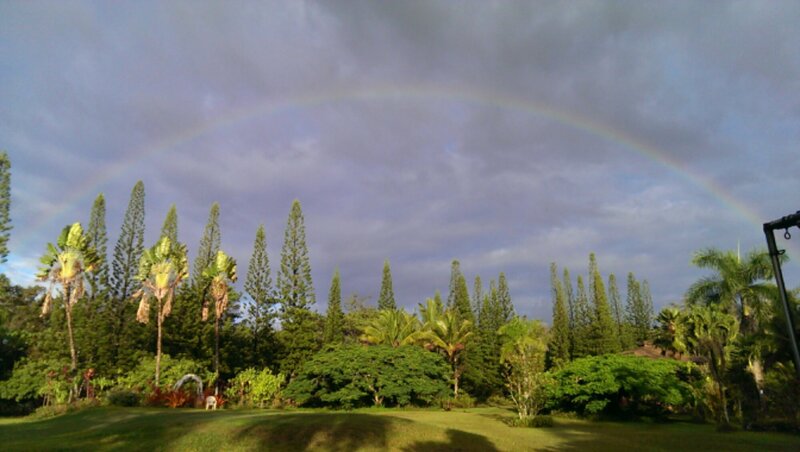 Arriving on The Big Island of Hawaii, I landed at an oceanside retreat center/ intentional community. There are currently 130 volunteers that run the center. Most of us live in tents in the jungle. That is where I live. We live on some of the newest land on this earth. Volcanic rock made from the near by active volcano, and the spirit of the volcano- “Pele”. Pele runs the show here. She is the creator and the destroyer. Respect towards Pele in her domain is of top priority in this land. She can bring you the most beautiful gifts in her jungle- or test you with the worst. Both are the same, both are sacred. A week after arriving here in the land of Pele, a permaculture department was formed for the retreat center. I received the position in the department to develop and implement the Korean Natural Farming systems for the “Living Soil Production”. Pele had indeed called me forth to work in the land made of volcanic rock. The community is desiring to grow more of it’s own food. To grow food you need soil. The land is hundreds of years away from being soil. This land is just now in it’s first growth of jungle, beneath is pure volcantic rock. My background solidified this position for me having studied Recycling, Resource Management, and Zero Waste at Santa Monica collage in California. I focused on organic resource management: vermicomposting and composting. Having my own urban farm community in Los Angeles (www.AwesomeTownFarms.Wordpress.com) gave me a great platform to dive deep into resource management. I developed and maintained my own resource management system for the small community within two houses, holding 3 kitchens and 9 members. I maintained a system of hauling food waste from a local restaurant every other day back to my community, composting it into soil for our own horticultural needs. Also feeding the food waste to my hundreds of pets- my worms- in their nine foot by five foot luxury underground vermicomposting systems I created for them. So my foundation was solid to take the position, however Pele did not call me all this way to her land for systems I was used to. She called me to discover more. Confessions From The Soil Blog is documenting the sustainable systems I have learned and are implementing along with documenting clear processes to share the journey around the world (That’s You!). Journey with me into the discoveries that cross our path and other confessions the soil wants to reveal along the way….